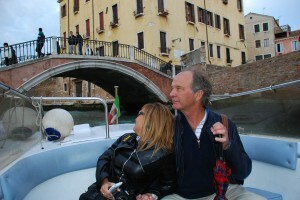 We have a routine we follow when we bring our clients to Venice. Since driving right up to the front door of the hotel is obviously out of the question, those who arrive by car to this watery city have only a few choices to get to their hotel. They can walk (pity those who make this decision. It might be free but the sight of poor out of breath souls lugging gigantic suitcases up and down numerous bridges and through crowds while getting lost on their way to their hotel just does not look like any fun at all) or you can take the Vaporetto, or water bus and be similarly crushed by crowds or you can go the luxurious (and shockingly expensive) way, by private taxi. The cost of option three is anywhere from 60 to 80 Euro ($78 to $105) depending on how many people and how much luggage. Now, there’s just a little hitch in this plan. “Official” water taxis, those identified by a yellow stripe, don’t pick up passengers at the largest and most convenient parking garage serving Venice. That’s Tronchetto. For some reason, the official cabs line up only at the less convenient and more expensive parking garages near the train station. Even though we gladly pay 21 Euro a day to park in the secure Tronchetto garage, it’s always been a bit of a pain to deal with the hustlers who operate what I call “Gypsy Water Taxis” from there to the city. 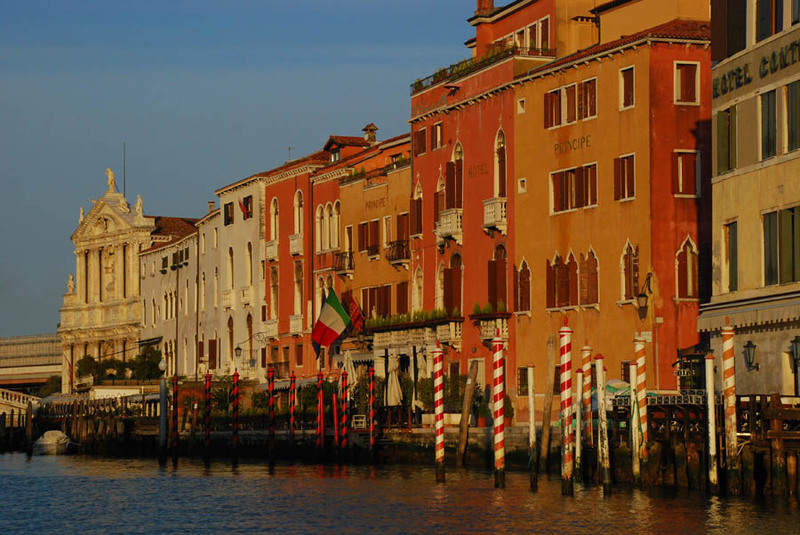 For the ride back to the parking garage, an official taxi is arranged by us the day before and they’re right on time on the day of departure, which is usually the day our clients fly home from the nearby Marco Polo International Airport. The difference in the quality of the boat is obvious from the start, as is the difference in the captain. Clean, courteous, speaking in complete sentences and happy to offer an official, stamped receipt. 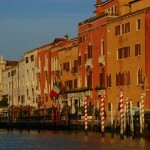 A cruise through the Grand Canal in the early morning light is also a nice bonus. 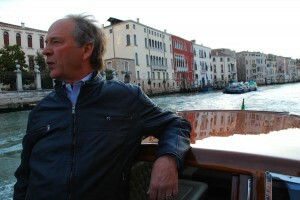 Posted in Europe Tours, Italy Tours and tagged taxi, venice, water. ← What is a Super Tuscan Wine?